Vintage 2016 has been fantastic for England, one to remember. It started slowly with poor weather during fruit set that led to low potential bunch weights. Damp and hot conditions affected some vineyards, more so in the Western counties, but those that avoided the fungal diseases this brought about thrived. Dry and hot weather prevailed in East Anglia throughout September and early October. This gave our growers the luxury that they don’t normally have – the confidence to hang the grapes on the vine for longer and achieve maximum ripeness. The small crop levels accentuated the ripeness levels, which for winemakers was like heaven. We were lucky to be able to source most of our fruit from Essex where the ripening conditions were near perfect. The grapes were exceptionally clean and ripe and yielded wonderful juice. Our Bacchus was picked at both extremities of the season. It performs best when either slightly under or over-ripe. Somewhere in the middle can be a ‘No man’s land’. Early Bacchus is herbaceous, crisp and aromatic whereas late Bacchus is full of ripe tropical and gooseberry fruits. This year could be a year for still white wines, which is why we also chose to make a Pinot blanc. This variety can produce wonderful wines when made from ripe grapes and is particularly well made in Alsace. 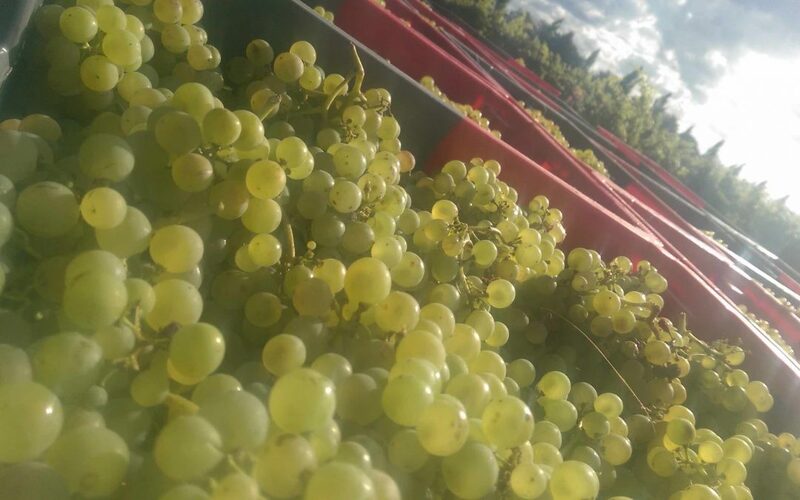 We picked exclusively from the sunny side of the vine meaning the berries were beautifully ripe, full of sugars and flavour and low in acidity. Our Pinot noir was picked in Essex to make a vintage-style ‘Blanc de noir’ sparkling wine. Again, ripeness levels were perfect. High sugars and good acidity, which is needed in sparkling wine. Finally, we organised a crack team of pickers to harvest a small amount of Pinot noir and Pinot noir precoce (early ripening relative of Pinot noir) from a tiny vineyard near Stratford-upon-Avon. Yields were ultra-low and ripeness was good and we hope to make a very small amount of red in a Beaujolais cru style.